Witches and wiccans are now accepted as normal religious figures. 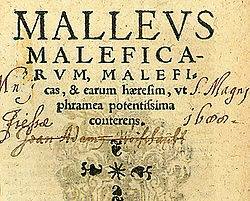 The classic text Malleus Maleficarum (The Hammer of the Witches) could be dispatched to the dustbin of history. But today there is a moral crusade against led not by priests but by the press and all ”right thinking people against new demons. Who are they and what can we learn from Malleus Maleficarum about the new witches and the witch hunters?